- EUR/USD. As expected, the past week was filled with all sorts of events. These included macroeconomic statistics from the USA, data on inflation in Europe, the UK and China, indices of current economic sentiments in Germany and the EU, the meeting of the US Federal Reserve Committee on Open Market, data on China’s GDP and the EU Brexit summit. All of these could affect the trends formation. Therefore, our experts considered two main scenarios. The first, "bullish" one, was the growth of the pair, first to the center of the medium-term channel 1.1525-1.1830, and then to its upper border. And the second, the “bearish”, the strengthening of the dollar and its decline to support 1.1430. - GBP/USD. The forecast given by most analysts and confirmed by 80% of the trend indicators and 70% of the oscillators on D1, has come true by 100%. According to the experts, the pair was supposed to reach the height of 1.3225, which it did on Tuesday, October 16. - Cryptocurrencies. We constantly write that the main factor determining the cryptocurrencies rates is not the economy and not the technical analysis figures, but the news and the rumors. The past week was a clear confirmation of this. On the morning of Monday, October 15, most bitcoin owners jumped out of their beds, shouting "Hallelujah!" it started finally: the rate of this reference currency on some exchanges soared from the mark of $6,380 to $7,700 in just a couple of hours, that is, more than 20%! This news was caused by problems with the Tether (USDT) cryptocurrency. Ordinary traders began to urgently sell off the stablecoin, buy up the bitcoin, as a result of which, the BTC/USD rate literally rushed into space. But the happiness didn't last long. It became clear soon that all this was just a provocation, after which a no less sharp collapse followed, and the rate returned to the usual values of the past month and a half. As a result, the authors of these fake news earned good money, and those who bought into this fake, lost a lot. Those whose Stop Loss or Margin Call worked as a result of the jump are also sad. We did not know what could happen on Monday October 15. But the forecast that the bitcoin, pushing off from the lowest point of its amplitude, should return to $6,325-6,835, turned out to be absolutely correct: the BTC/USD met Saturday at $6.535. The bitcoin fate was repeated by the rest of the top cryptocurrencies: many, like, for example, the ripple (XRP/USD) and the ethereum (ETH/USD), ended the week with a slight increase, other, like the litecoin (LTH/USD), finished with the nil result. - EUR/USD. Although some analysts talk about five, and even about ten key events of the coming week, in our opinion, it is not worth focusing on the economic calendar in this case, and it will not bring any special surprises for traders. Therefore, it may be worthwhile to pay more attention to longer-term forecasts and technical analysis. Giving a forecast for the EUR/USD pair, most experts (70%) assess the outlook for the dollar positively. In their opinion, the goals of the pair are still the support levels of 1.1430 and 1.1300. About 70% of trend indicators and oscillators on H4 and more than 80% on D1 agree with this scenario. - USD/JPY. If for the pair GBP/USD the experts expect the dollar to strengthen, the picture for the USD/JPY is reversed: in their opinion, the Japanese yen should strengthen. Both 65% of analysts, graphical analysis, and oscillators on D 1 agree with this. The goals are 112.00, 111.65 and 110.70. - Cryptocurrencies. It is clear that we, similar to most analysts, cannot predict the stuffing of the next fake news. However, there circulate sustained rumors that the Wall Street is preparing a second wave of invasion to the crypto market. One of the largest holding companies Fidelity Investments, Goldman Sachs, as well as other investment banks can become a “shock force”. However, these are all hopes of the blockchain apologists. At the moment, the market is in a state of consolidation, and therefore we can only repeat the previous forecast with minor adjustments: the movement of the pair BTC/USD in the range $6,325-$6,900. At the same time, major players may still attempt to bring down the rate to the level of mining profitability in the region of $6,100, where they are beginning to actively buy coins. A provocation similar to the one that happened on October 15, is unlikely in the near future. 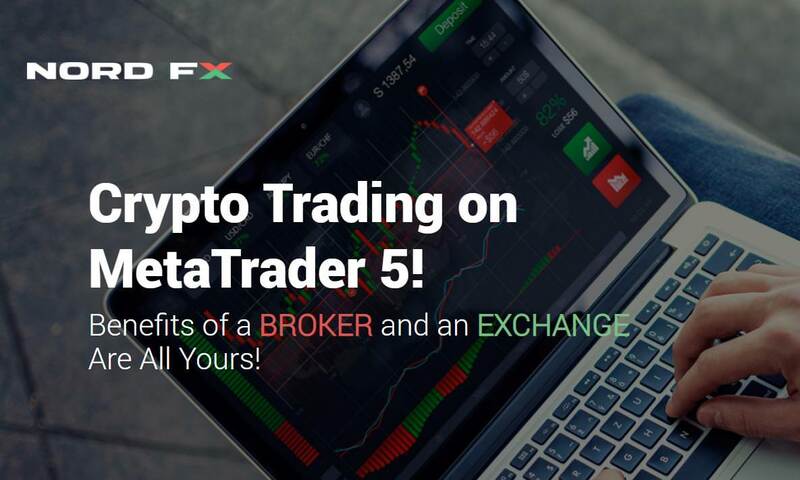 The international broker company NordFX, in addition to MT4, launched exchange trading in cryptocurrencies based on the MetaTrader-5 platform, early September. This platform, as well as the Crypto account, is intended only for operations with cryptocurrencies, where all clients carry out transactions not with a broker or an exchange, but exclusively with each other. At the same time, the system is completely transparent: thanks to the depth of the market, each limit order is visible to all trade participants. As before, traders have an opportunity to profit not only from the growth, but also from the fall of cryptocurrencies. As for margin trading, its opportunities have become much wider. If it is $300 that you need to open a position of 1 bitcoin on MetaTrader-4 at the moment, it is just $100 that is enough on MetaTrader-5. Thanks to the presence of two platforms, MT4 and MT5, traders can apply a wide variety of trading strategies using dozens and hundreds of indicators. There are no restrictions on the use of expert advisers either. And thanks to the low commission and the rapid execution of orders, it has become possible to profit from the slightest market fluctuations. In total, there are 14 main crypto pairs, cross pairs and 4 crypto-indexes available for trading 24/7/365 without holidays and holidays at the moment. The Crypto account is intended exclusively for exchange crypto trading. For traditional trading, you can use the MT4 platform, where you can also trade major fiat currencies (33 currency pairs), gold and silver, using a leverage of up to 1:1000. The Crypto trading account for MT5 can be nominated in both US dollars and in bitcoins or Ethereums. Accordingly, depositing and withdrawal to wallets are also possible in USD, BTC and ETH. To get more information about this account and the terms of trading on the MetaTrader-5, please visit the NordFX website. 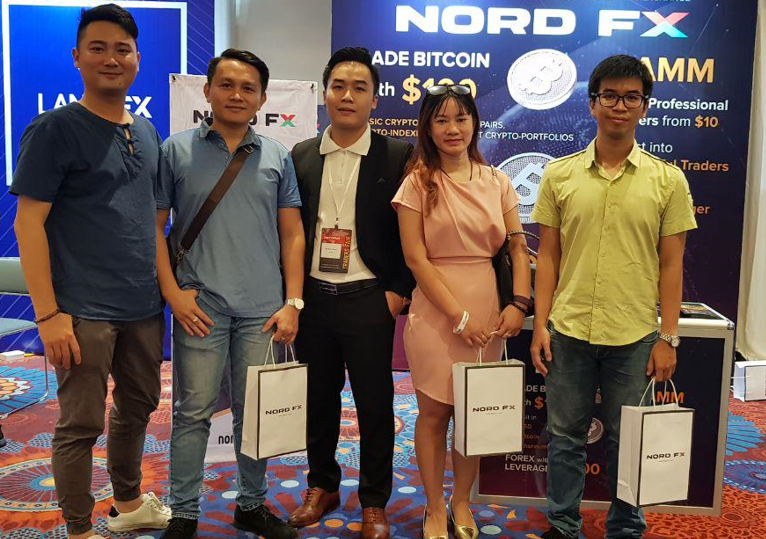 The NordFX computer system has a high degree of protection: there has not been a single case of its hacking during 10 years of its work in financial markets. The company has been honoured with more than 35 professional prizes and awards, among them Most Reliable Broker 2016 and 2017, Best Crypto Broker Asia 2017 and Best broker for Trading Cryptocurrencies 2018. - EUR/USD. When giving the forecast, we assumed that none of the events noted in the economic calendar would be able to considerably shake the market. And we were right: the market reacted rather sluggishly even to the ECB chair Mario Draghi 's statements and to the US GDP data, which turned out to be 0.2% higher than expected. - Cryptocurrencies. As we had predicted, having calmed down after the fake news input on Monday, October 15, the market moved to the consolidation phase. The ripple demonstrated the highest volatility (about 8%). A At the same time, the bitcoin, the litecoin and the ethereum behaved even quieter than many conventional currency pairs and equity. The BTC/USD, for example, stayed in a very narrow corridor of $6,460-6,655, even despite another hacking of another crypto exchange. - EUR/USD. The majority of analysts are still waiting for further strengthening of the dollar. Although, this majority is small, 55% vs. 45%. - GBP/USD. The pound has already reached the September lows in its fall, the next goal is the 2018 lowest point, 1.2660. And 70% of experts do not see serious obstacles to achieve it. - USD/JPY. By Friday, October 26 evening, the pair stopped its fall and, having turned, was able to break through the strong support/resistance level of 111.80. Most experts (70%), supported by graphical analysis, believe that this is a clear signal to the next strengthening of the dollar and the rise of the pair to at least 112.85. The following goals are 113.35 and 114.55. - Cryptocurrencies. The number of Google searches for the reference cryptocurrency has decreased by 93% in the ten months of this year. The total capitalization of the crypto market has been fluctuating around $200 billion for more than two months, which indicates a decline in investor interest in both the bitcoin and the market as a whole. - EUR/USD. Recall that most experts (55% vs. 45%) voted for further strengthening of the dollar, calling the year's low of 1.1300 recorded on August 15 as the goal. This forecast came completely true, and the pair touched the bottom at this point on the last day of October, which was also facilitated by the optimism of the US President regarding the negotiations with China. True, in contrast to D. Trump, Larry Fink, head of one of the largest BlackRock investment funds, said he expected a full-scale trade war with China in the coming weeks. - Cryptocurrencies. Our forecast said that in the absence of really important news, the BTC/USD will continue to move in the narrow range of $6,325-6,660 with a predominance of the bearish sentiment. The next support was around $6,100. This scenario was realized with a small tolerance: pushing off from the resistance of 6.550, the pair went to the lower border of the lateral channel 6.320. The bears managed to break through it in the middle of the week, and the bitcoin dropped to the horizon of 6,240, but quickly turned around and climbed to the center of the side channel in the 6.425 zone. This confirmed the assumption that, knocking the rate down to the mining profitability level, the major players are beginning to actively buy coins, as a result of which the quotes are quickly returning to the initial level. - EUR/USD. We await two major events that can dramatically affect the fate of all dollar pairs this week. These are the mid-term elections in the USA on November 6 and the Fed's decision on the interest rate on November 8, followed, as usual, by the comment of the head of the Federal Reserve. One can also add to this the falling oil prices, quite unexpected statements by the US President and optimism about the agreement on British withdrawal from the EU, which has a positive effect on quotes not only for the pound, but also for the euro. - GBP/USD. In addition to advancing Brexit negotiations, last week's pound growth was supported by the statement from Bank of England CEO Mark Carney that the regulator is ready to raise the interest rate in any event, including even the “complicated Brexit”. This is about raising the rate to 1.5% within three years (previously 1% was mentioned). - Cryptocurrencies. Despite the fact that the price of the bitcoin and of other top coins has been fluctuating in a fairly narrow range for a long time, it’s too early to say that this market has died. And although the total capitalization is still close to $200 billion, the daily trading volume remains quite impressive, about $4.2 billion. And the number of transactions (250 thousand per day) shows that traders are in no hurry to part with their digital assets. - This fund includes shares of such world industrial giants as Motorola, Nike, Ferrari, Boeing, Coca-Cola, HP INC, McDonald's, etc. - Shares of major representatives of various industries, with greatest reliability and potential for growth are collected in this fund. These are shares of Amazon, Netflix, MasterCard, Visa, Google, Facebook, PayPal, etc. More information about the investment offers of NordFX can be found at company site or by contacting the company's Support Service. - EUR/USD. The first good news that pushed the euro up, as expected, was the extraordinary Summit of European leaders on Brexit. Its positive results allowed the European currency to rise to the level of 1.1383 on Monday, November 26, after which the power over the market was seized by the dollar once again. - Cryptocurrencies. The forecast for this market was negative, and it was 100% justified: over 80% of all coins, followed the bitcoin, having gone into a deep minus. The intrigue was only in how low the reference cryptocurrency would be able to fall together with other coins during that week. - EUR/USD. If you look at the graph, it is clear that in November the pair drew a “pennant” striving to consolidate around 1.1315-1.1350. As for its further movement, most experts (60%) and more than 90% of the indicators on H4 on D1 expect further strengthening of the dollar and new testing of the 2018 low, 1.1215. - GBP/USD. The pair is near the year lows zone at the moment, 1.2670-1.2695, and graphical analysis on H4, supported by more than 90% of trend indicators and oscillators, predicts their breakdown and a quick fall to the 1.2600-1.2620 zone. - USD/JPY. Although we would like to give a clear forecast, there are no pronounced preferences among experts for the Japanese currency either: exactly half of them have voted for the pair's growth, and exactly half are for its fall. Everyone is waiting for the results of the G20, and here the forecasts are also quite ambiguous. - Cryptocurrencies. The situation with forecasts for cryptocurrencies is complicated by the fact that it is almost impossible to estimate their real value. They are so virtual that estimates can be differ tens, hundreds or even thousands of times. It is not particularly worth it to focus on the miners' costs either, as they do not do any useful work and do not produce any material values or benefits. They only spend their time, money and electricity. I have one question to ask and that’s whether do you guys have any connection to Nova FX? I worked on that company years ago and later it closed out leaving my balance gone. I heard that you guys have some connection, is that true? We have nothing to do with Nova FX. - EUR/USD. Our forecast for relatively weak labor market data turned out to be 100% correct. ADP and ISM in the service sector were not pleasing either, and one of the key indicators, NonFarm Payrolls, fell from 237K to 155K, that is, by as much as 35%. - Cryptocurrencies. There’s really nothing to say: the graphs vividly confirm that the worst predictions are coming true. 60% of experts predicted a further drop in Bitcoin, and on Friday evening, it recorded another annual low at around $3,275, having lost another 16% in seven days. Following the “reference” (now in quotes) cryptocurrency, the altcoins fell further down. Ethereum (ETH/USD) fell by 24% during the week, Litecoin (LTC/USD) - by 26%, and Ripple (XRP / USD) - by 18%. - EUR/USD. As has already been mentioned, it is time for the market to record annual profits. Or losses (it depends). However, the coming week is expected to see a number of macroeconomic data, which may still affect the change in quotations. - USD/JPY. On Monday, December 10, statistics on Japan’s GDP will be published and, strictly speaking, these are the only data from the country of the Rising Sun that may affect the pair’s quotes. Investors pay much more attention to the trade war between China and the United States and the use of the yen as a safe haven currency. That is why most experts (65%), with the support of trend indicators, vote for the strengthening of the Japanese currency and the reduction of the pair to at least 112.20 support. The next support is on horizon 111.75, then 110.85. As for the resistances, they are in the zones 113.20, 113.65 and 114.00. - EUR/USD. If the basic forecast for the past week had assumed a lateral movement in channel 1.1310-1.1415, the meeting of the European Central Bank and the subsequent conference of the ECB President Mario Draghi were called as the basic event. The ECB made a long-promised decision on January 1, 2019 to complete the quantitative easing program, and Draghi demotivated investors with a statement of increased risks. Based on this, the forecasts of the region’s economic growth for 2018-19 were lowered, to which the euro responded with a fall, but still remained within the limits of the stated channel. - Cryptocurrencies. The news background in recent days has been quite blurred, and positive news alternated with negative news. Among the events that are encouraging are the possible release of the Japanese crypto exchange Coincheck to the US market, the record for Bitcoin analogue ETF demand in Switzerland, and the news that the embedded Ethereum wallet will appear in the Opera browser. A balance to these was the news that for the first time in history, the Securities and Exchange Commission (SEC) of the United States fined the cryptocurrency bank AriseBank because of fraud allegations. The bulls were also frustrated by the news that due to the unfavorable situation in the cryptocurrency market, the mining giant Bitmain is closing its unit in Israel. - EUR/USD. The color here is red. It is almost an unprecedented case: 100% of the oscillators and 100% of the indicators on H4 and D1 are painted exactly in this color. 70% of experts also vote for the growth of the dollar and the fall of the pair. The reason for this is interest rates. - GBP/USD. The British currency is facing a lot of events next week. On Wednesday, December 19, a block of inflation data will be published. And even if the inflation grows, the market may consider that such an increase is due to the weakening of the pound because of Brexit. The next day, the Bank of England will announce the interest rate decision, which is likely to remain unchanged, which will also play against the pound. Data on the GDP growth rates on Friday is unlikely to seriously affect the overall dynamics of the British currency. And they are negative. - USD/JPY. Regarding the future of this pair, the indicators do not give any clear guidelines: their readings are divided almost equally. The same applies to the expert opinions: 45% of them are for the fall of the pair, 50% are for the continuation of growth and 5% just shake their shoulders. Such uncertainty becomes clear if you look at the pair's chart, which is now located approximately in the middle of the six-week side channel 112.30-114.00. - cryptocurrency. 60% of experts expect Bitcoin to continue the downtrend to the strong zone, fixed in July-August 2018, $2,500-2,700. The nearest support is in the $2,940-2.050 zone. In addition to the overall negative dynamics, the experience of the past year also plays in favor of bears, when at the end of December many wallet owners wanted to transfer their crypto savings to fiat currencies. - EUR/USD. Despite the fact that, on the eve of the US Federal Reserve interest rate increase, 70% of experts, supported by 100% indicators, expected the dollar to strengthen, nothing of the kind happened. The euro was growing for the whole week, approaching on Thursday the last eight weeks' high at the height of 1.1485. - USD/JPY. Last week, the US dollar dropped significantly, not only against the euro. The DXY U.S. Dollar Index, which tracks the US currency against a basket of other major currencies, fell on Thursday to an eight-week low of 95.73. Its fall against the Japanese yen was particularly impressive, the yen won around 260 points against the dollar by Thursday. Experts say that the main reasons for such a jump are sales on the stock markets and the flight of investors to the yen as a safe haven in the face of continuing tensions in trade relations between the United States and China. - Cryptocurrencies. The past week was marked by a steady growth of both the reference cryptocurrency and all major altcoins. The maximum growth of bitcoin (BTC/USD) was 33%, ethereum (ETH/USD) - 46%, litecoin (LTC/USD) - 45%, ripple (XRP/USD) - 41%. The most impressive increase, by 176%, was demonstrated by the Bitcoin Cash (BCH/USD), reaching $220 per coin at the peak. The total capitalization of the crypto market grew from $103 billion to $134 billion, that is, by 30%. The reasons are both global, such as falling investors' interest in classic assets on world markets, and private ones, such as news on the closing of the short position, which was opened a year ago by a well-known crypto trader Mark Doe. There may be called a lot of reasons, but the main question that worries the whole crypto community is whether this weekly increase is not a short-term correction. Or is it, which is even worse, another trap, arranged by bears for the bulls? Whatever it may be, but at the end of the week, Bitcoin buyers met strong resistance at $4,300, resulting in this cryptocurrency's fall to $4,000. And other digital assets slipped a little as well, following it. As for the forecasts, it should be noted an error is quite often not in defining targets, but in determining the timing of their achievement. This is especially true of the coming days. The past week was the last full trading week in the past year. Next week, trading will begin only on Wednesday, December 26, and the world will celebrate the New Year during the night of Monday, December 31, to Tuesday, January 1. That is why this time we decided to discuss experts' opinions not only for the upcoming week, but also for the next month, which we hope will help traders in more accurate determination of trends and benchmarks. - Cryptocurrencies. Despite their growth last week, the general mood in the crypto market is rather gloomy. More than 70% of analysts and market participants believe the current rise is purely speculative and they expect the downtrend to resume. They are still expecting bitcoin to fall to the strong zone, recorded in July-August 2018, $2,500-2,700. Moreover, such a fall may take from one to two months. The nearest support is in the $2,940-2.050 zone. - Not having recovered after the New Year celebration, in the morning of January 2, the pair EUR/USD made a sharp dash to the south, losing almost 200 points in a day. Then, however, everything returned to normal, and the pair quickly returned to Pivot Point 1.1400, around which it has been revolving since October 2018. On Friday, January 5, using positive data from the US labor market, the dollar tried to regain the lost ground, but the attempt failed, and the pair ended the week at 1.1394. - Cryptocurrencies. Against the background of the major currency pairs Bitcoin demonstrated a remarkable stability last week, keeping on to lateral movement in a narrow corridor of $3,775-4,100 and returned where it has repeatedly been in the last six weeks by Friday evening, to the level of $3,955. Following the example of the reference cryptocurrency, the Olympic calmness was shown by Litecoin (LTC/USD). But Ethereum and Ripple behaved somewhat more actively. Thus, the ETH/USD pair has grown by 12%, rising above the $160 mark, and the XRP/USD pair, on the contrary, lost 7%, although it could not break through the support of $0.3560. - EUR/USD. Both trend indicators and oscillators on H4 and D1 have taken a neutral position. The opinions of the experts are divided as follows: 20% have voted for the growth of the pair, 40% are for the sideways trend and 40% are for the strengthening of the dollar and the fall of the pair. It should be noted that in the transition from the weekly to monthly forecast, the number of supporters of strengthening the US currency rises to 65%. Graphical analysis on D1 also indicates a possible decrease of the pair to December lows in the 1.1215 zone. The nearest strong support area is 1.1305. As for the “bullish” scenario, according to its supporters, the dollar will continue to be pressured by political uncertainty in the United States. The nearest strong resistance zone is 1.1485-1.1500, in case of its breakthrough, the next target for the bulls will be consolidation in the zone 1.1550-1.1625. - GBP/USD. Here, of particular interest are the speech of the head of the Bank of England, Mark Kearney on January 9, as well as data on UK GDP, published on January 11. However, in both cases, one should not expect any special surprises, and the uncertainty associated with the British exit from the EU will continue to be decisive for the British pound exchange rate. That is why 65% of experts predict a further fall of the pound. According to them, with the support of graphical analysis on D1, the pair will first test support 1.2615 once again and, if successful, will move to the zone 1.2475-1.2525. It is unlikely to achieve the low of the first week of January in the 1.2400 zone in the upcoming week. 20% of analysts are in favor of the GBP/USD sideways trend, and only 15% have sided with the bulls, suggesting movement of the pair in the corridor 1.2715-1.2835. The next resistance is 1.2925. At the time of writing the forecast, about 90% of indicators sided with the bulls. However, most likely, this is only a consequence of the upward movement of the pair on January 3-5. Moreover, 10% of the oscillators have already signaled that it is overbought, which indicates a possible reversal of the pair to the south. - Cryptocurrencies. The behavior of BTC/USD does not give reasons for optimism or pessimism. Therefore, the experts' opinions are divided almost equally: 30% are for the growth of Bitcoin, 30% are for its fall and 40% are for the continuation of the sideways trend. At the same time, the total capitalization of the crypto market is at the level of the end of December last year, around $130 billion, which also does not allow for making any predictions. Although some experts, based on the cyclical nature of the growth and the fall of quotations, argue that the first quarter of 2019 will be on the side of buyers, and expect the pair to rise to $4,800-5,200. The alternative scenario: the end of the correction and the fall of BTC/USD to the strong zone, recorded as early as July-August 2018: $2,500-2,700. Moreover, such a fall may take from one to two months. The nearest support is in the $2,940-3.050 zone. Two more good pieces of news have been brought by the Market Leader magazine, which has published the results of the Expert Council of the MasterForex-V Academy voting. The administration and professional traders of the Academy evaluate the real results of financial organizations throughout the year, and at the end of the year they sum up the final results. 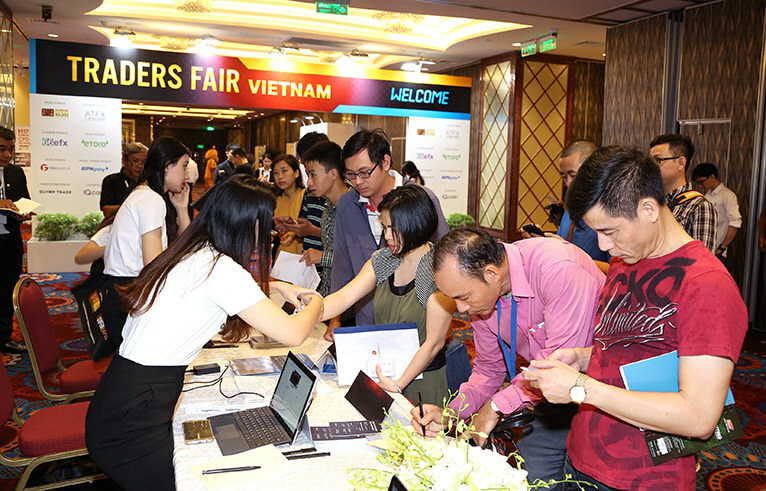 According to the chairman of the contest jury, the rating of MasterForex-V Expo, which is compiled on the basis of two dozen criteria, is an Expo during which the best brokers are objectively presented. And thus in 2018, for the fourth year in a row, NordFX receives the Grand Prix and the title “World Best Broker”. The company scored most votes on a variety of criteria, including the best dealing quality, the best innovations, the best investment products and funds, and a number of other equally important parameters. Suffice it to say that about 55% of the Academy's traders have opened their trading accounts in NordFX. The company has received another award from MasterForex-V Expo in the nomination “Best Crypto Broker 2018” for creating unique trading conditions that enable traders to achieve best results when trading in the cryptocurrency market. We sincerely thank everyone who has given us their votes, and we understand that these awards are not only a proof of the company's success in the past, but also oblige us to make every possible effort to justify your trust in the present and in the future. - EUR/USD. On Wednesday, January 9, after repeated attempts, the pair managed to break through the upper limit of the mid-term side channel in which it was located, starting from November 2018. Having overcome the resistance in the area of 1.1500, it reached the height of 1.1570, after which the followed by a trend reversal, and the pair once again found itself within the above channel, ending the week at 1.1470. - Cryptocurrencies. Our review is fundamentally different from other reviews in that it is not an opinion of one particular analyst. In our analysis, we strive to collect as many opinions of various experts as possible so that, getting rid of harmful “noises”, we can identify the main trend that determines the movement of the pairs in one direction or another. However, it can be very difficult, as, for example, now, for cryptocurrencies. - EUR/USD. As you know, the European currency has a strong correlation with oil and metals. And on the commodity market, we are now witnessing a positive trend, especially with regard to energy. The intentions of OPEC to completely remove the excess oil from the market should lead to a further increase in prices, which plays into the hands of the euro. The pause, taken by the Fed regarding the increase in lending rates for the US dollar, is worrying investors. - GBP/USD. It is clear that the absolute majority of indicators are currently colored green. However, already 10% of oscillators on D1 signal that this pair is overbought. The possibility of its falling to the horizon 1.2600 is indicated by graphical analysis on the daily time frame as well. As for experts, there is no clear advantage here either for bulls or bears. 55% of them have voted for the growth of the pair, and 45% are for its fall. - USD/JPY. Indicators and graphical analysis on D1 predict a strengthening of the Japanese currency, with which 65% of experts agree, they expect the pair to decline to 107.50-107.80, and then even lower, to support 106.70. - Cryptocurrencies. Despite the fall in the crypto market capitalization, the average daily number of transactions with Bitcoin approached 280,000 over the last week, which is comparable to the peaks of 2018. Therefore, it is is hardly worth it to predict the end of the benchmark cryptocurrency, and indeed the entire market. But the probability of the BTC/USD breakout of support $3,700 and its return to the mid-December lows in the $3,250 zone remains quite high. This scenario is supported by 45% of experts.